The Nortel Norstar T7100 phone is an entry level, single-line telephone designed for public areas such as lobbies, cafeterias, hallways, break rooms, or other locations where use is occasional. Originally the Nortel Norstar T7100 phone, this is now continued as the 7100 telephone. Note: You can buy new or factory reconditioned T7100 phones. Both have a 1-year warranty. Factory reconditioned phones are functionally and visually indistinguishable from new phones. 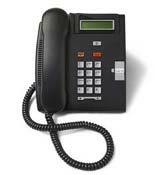 Local telephone companies: Buy Nortel Norstar T7100 phone sets at wholesale prices for your rental programs.